Line backing tray with baking paper / silicone sheet. On a lightly floured surface, roll out the pastry to a thickness of 3mm. Using a 10cm plain pastry cutter, cut out 12 rounds from the pastry. Lift the rounds on to the baking trays and prick each a few times with a fork. Chill for 30 minutes. Meanwhile preheat the oven to 200 degrees c.
Bake the pastry rounds for 15-20 minutes until golden, then transfer to wire racks to cool. Whisk the egg yolks sugar for 2 minutes until light and creamy, then whisk in the flour until just blended. Bring the milk to the boil over medium heat and pour it over the egg mixture, whisking to blend. Return to the pan, bring to the boil and boil for 2 minutes, whisking constantly. Remove the pan from the heat and pour into a bowl and place a later of cling firm over the bowl to prevent a skin from forming. Set aside. To assemble, carefully split the pastry rounds in half. Spread each round with a little pastry cream. 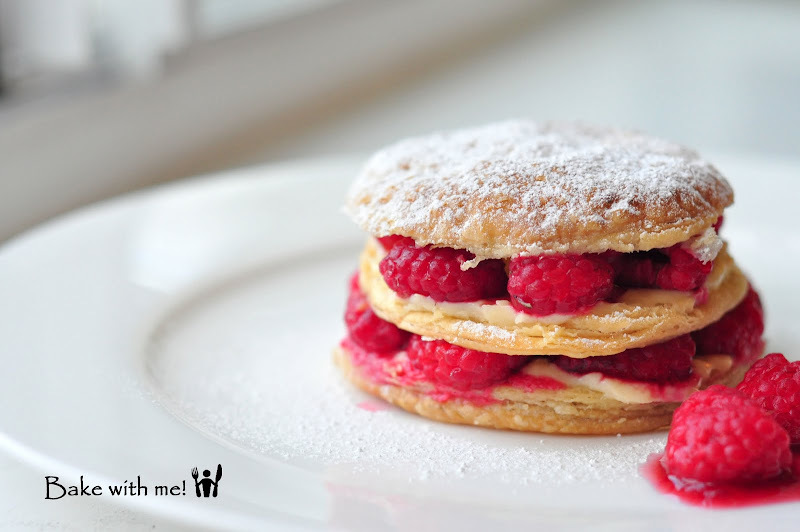 Arrange a layer of raspberries over the cream and top with a second pastry round. Spread with a little more vream and a few more raspberries. Top with a third pastry round and dust with icing sugar. 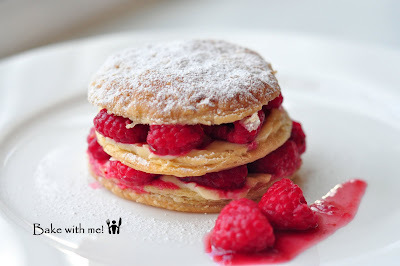 Filed under: Baking | French • Share on Facebook • Google+ it • Save to del.icio.us • Digg it!